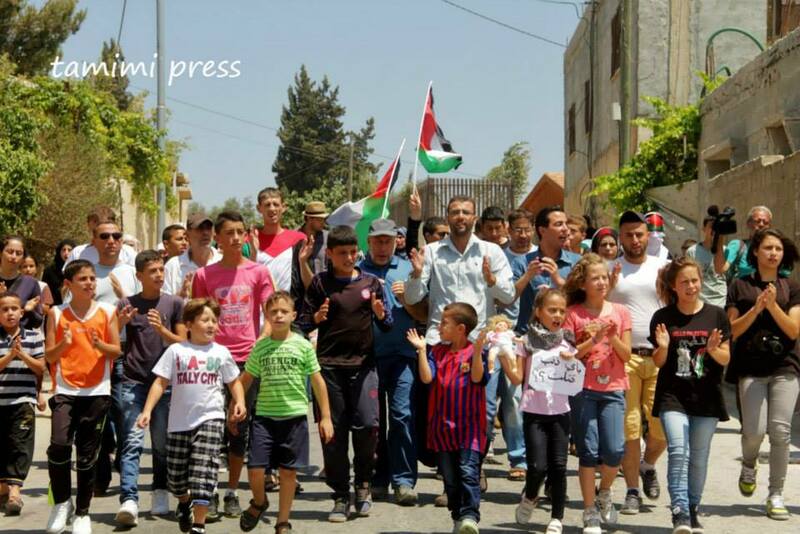 The weekly Friday demonstration in the village of Nabi Saleh was a show of solidarity with the Palestinians in Gaza, who have been under constant Israeli fire in the past few weeks. Around 1500 Palestinians have been killed in the#Gaza strip so far, about a third of them children. Villagers accompanied by international and Israeli activists marched today from the centre of the village calling for an arms embargo on Israel, justice for the victims and an end to the massacre. 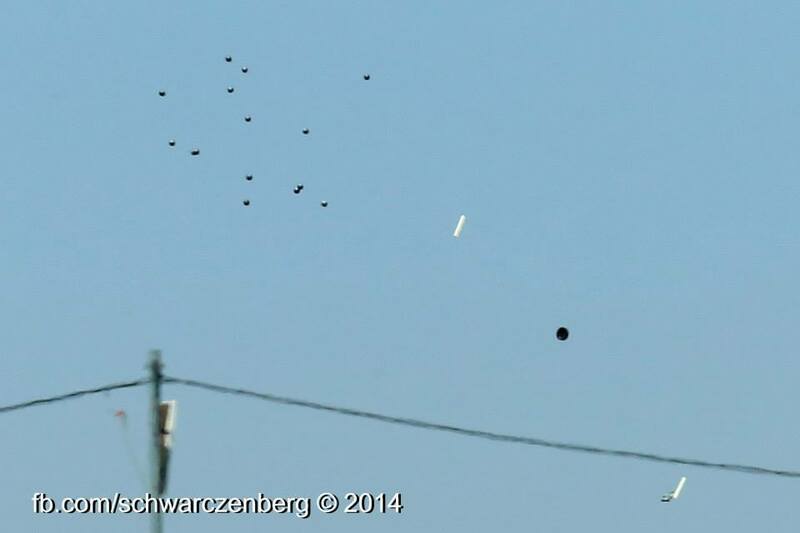 The Israeli army responded with barrages of tear gas, rubber-coated steel bullets and a few rounds of live ammunition. No major injuries reported. 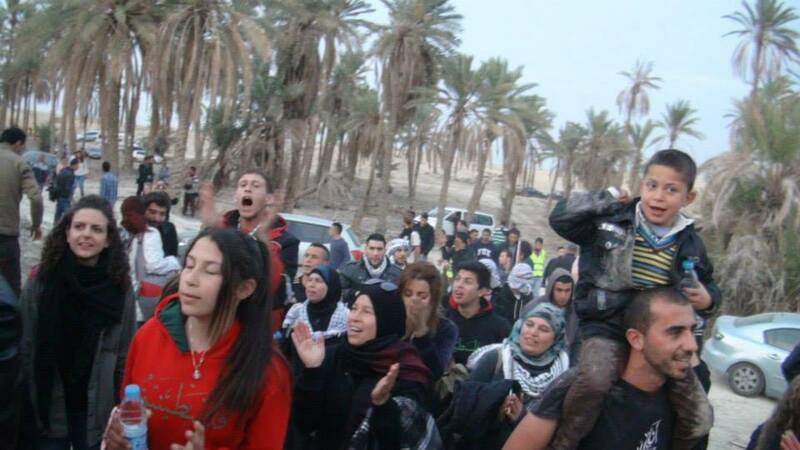 After the weekly rally in Nabi Saleh, residents travelled to the Jordan Valley to participate in the Mileh al-Ard campaign and the repopulation of the Ein Hijleh in opposition to Israel’s ethnic cleansing and occupation. 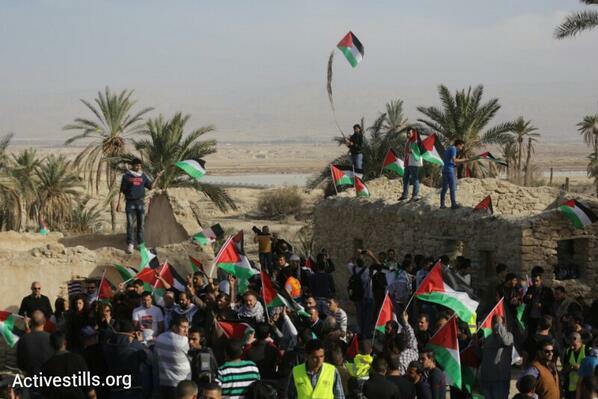 Late on Friday afternoon (Palestinian time), more than 300 Palestinians from across the Occupied West Bank repopulated the village of Ein Hijleh in the Jordan valley in opposition to Israel’s ongoing ethnic cleansing and occupation. By early evening the number had grown to more than 500 people, with Palestinians from Nablus, Jerusalem, Bilin, Nabi Saleh and many other towns and villages joining the protest camp. 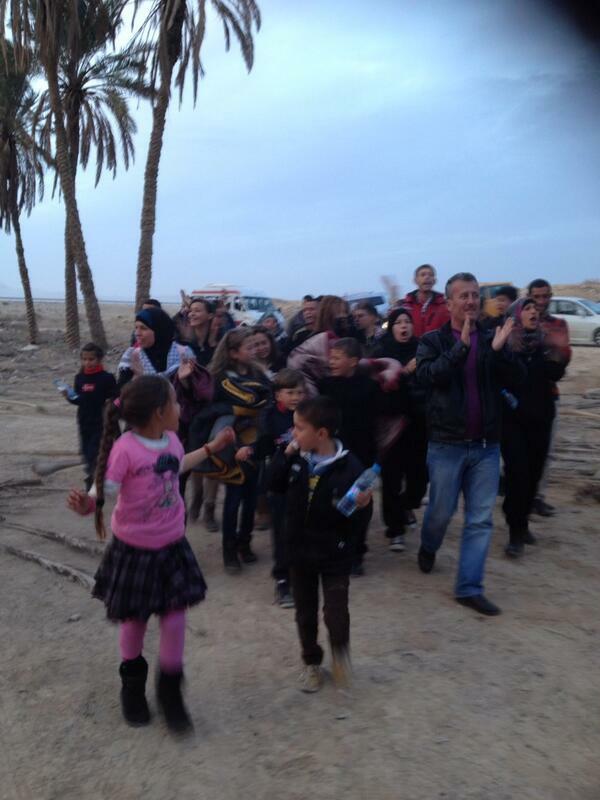 Nabi Saleh residents arrive in Ein Hijleh. Photo by Diana Alzeer. Hundreds of Palestinians announced today the launching of “Melh Al-Ard” (Salt of the Earth) campaign by reviving the village of Ein Hijleh in the Jordan Valley on land belonging to the Orthodox Church and St. Gerassimos monastery. The campaign is launched in refusal of Israeli policies aimed at Judaizing and annexing the Jordan Valley. We, the daughters and sons of Palestine, announce today the revival of Ein Hijleh village as part of Melh Al-Ard campaign in the Jordan Valley. The action aims at refusing the political status quo, especially given futile negotiations destroying the rights of our people for liberation and claim to their land. Accordingly we have decided to revive an old Palestinian Canaanite village in the Jordan Valley next to so called “Route 90” linking the Dead Sea to Bisan. The action is part of a continuous step against the Israeli occupation’s plan to take over and annex the Jordan Valley. This step is a popular act against Israeli oppression of the Palestinian people and the constant Judaization of the land. From the village of Ein Hijleh, we the participants announce that we hold tight to our right to all occupied Palestinian lands. We refuse Kerry’s Plan that will establish a disfigured Palestinian state and recognizes the Israeli entity as a Jewish State. Such a state will turn Palestinians living inside lands occupied in 1948 into residents and visitors that can be deported at anytime. We affirm the unity of our people and their struggle wherever they are for our inalienable rights. Ein Hijleh village is located in what is called “Area C” in the Jordan Valley, which is under threat of annexation by Israeli policies and Kerry’s plan. Therefore, we have decided to take charge and call for a national action to protect the Jordan Valley and put an end to the constant Judaization of Palestinian lands. Based on our support of the Boycott, Divestment and Sanctions Movement (BDS) we call upon our friends and international solidarity groups to stand with the demands of the Palestinian people and boycott all Israeli companies including Israeli factories and companies that work in the Jordan Valley and profit from Palestinian natural resources. For instance, we ask you to boycott Mehadrin, the largest Israeli exporter of fruits and vegetables, some of which grown in the Jordan Valley. In addition, Hadiklaim, that exports dates produced by Israeli settlers in the Jordan Valley. We also call on you to boycott both Ahava and Premier, cosmetics companies that use Dead Sea minerals to produce its products. The campaign, “Melh A-lArd” (Salt of the Earth), quotes a phrase from the bible, Matthew 13:5, which says, “You are the salt of the earth. But if the salt loses its saltiness, how can it be made salty again? It is no longer good for anything, except to be thrown out and trampled underfoot.” The name of our village, Ein Hijleh, is based on the original Canaanite name and the water spring (Ein) present there. We the sons and daughters of Ein Hijleh call upon our people to join the struggle to revive the village and protect our rights, history, culture, and land. Daughters and sons of Palestine, be the salt of this earth and stay steadfast on it. 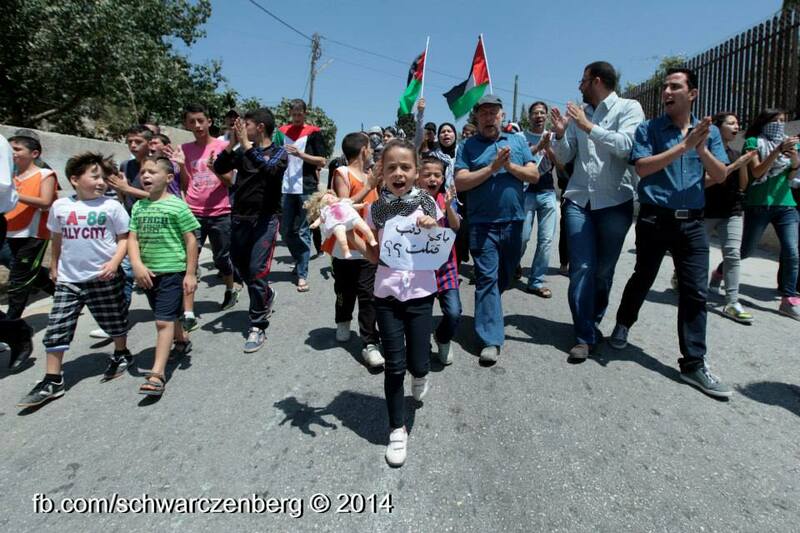 Video: Nabi Saleh marches in solidarity with the global march to Jerusalem. 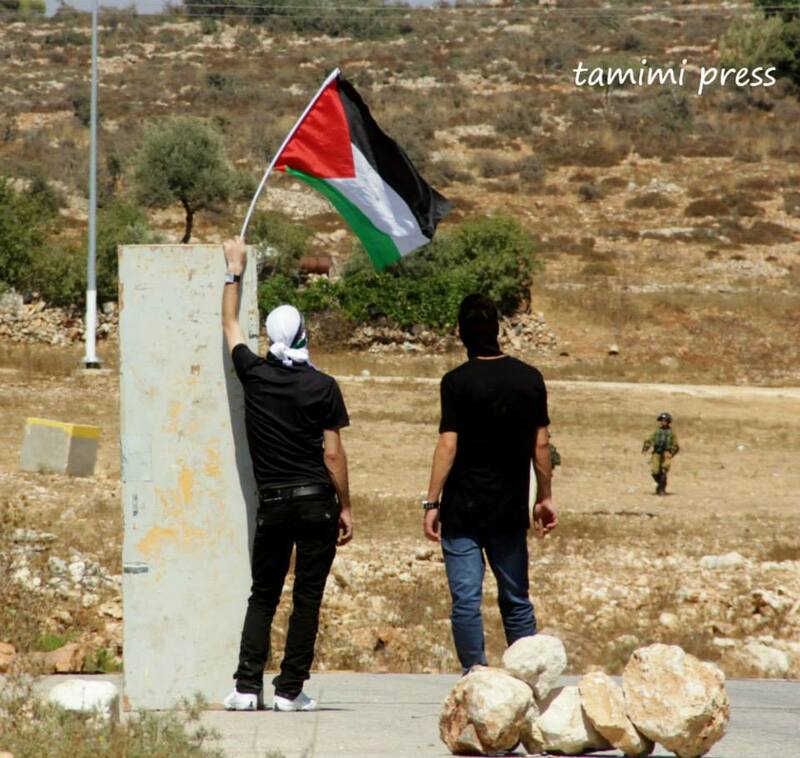 7 June 2013 – Friday’s demonstration in Nabi Saleh was in solidarity with the Global March to Jerusalem. 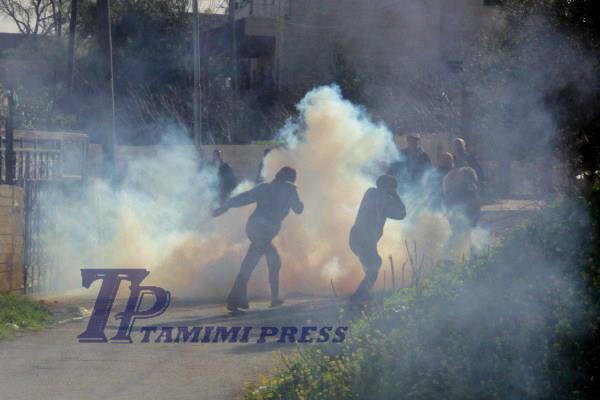 Activists on the ground report that Israeli Occupation Forces are firing teargas, rubber coat bullets and skunk. On Friday 8 March and Friday 15th March, the residents of Nabi Saleh did not hold their weekly march in the village.On March 8, the residents of Nabi Saleh and their supporters joined the funeral for the martyr Mohammed ‘Asfour, 22 years, who died on Thursday March 7 as a result of being shot with a steel coated rubber bullet on February 22nd by the Israeli Occupation Forces with a rubber coat steel bullet. Mohammed funeral was attacked by Israel Occupation Forces who fired teargas and steel coated rubber bullets at funeral goers. 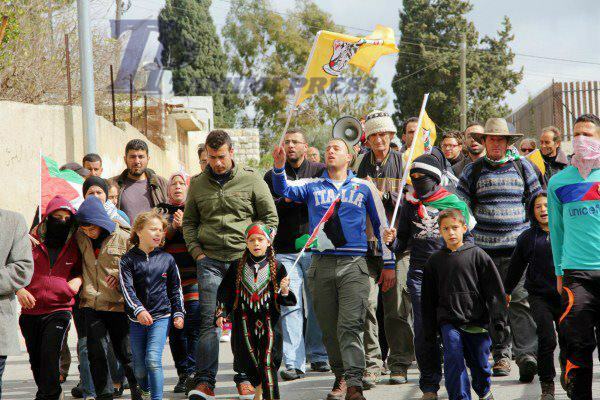 On Friday, 15 March, the residents of Nabi Saleh and their supporters joined the Nabi Saleh joined the nearby demonstration in Aboud village to commemorate Mohammed Asfour. 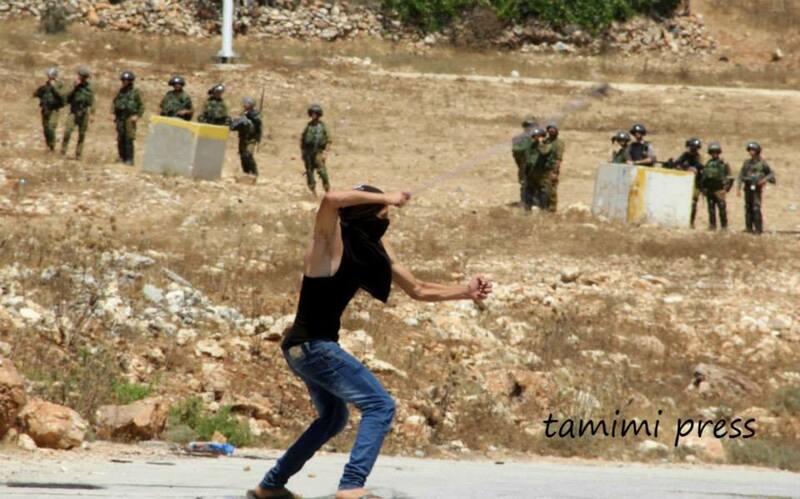 The demonstration was attacked by the IOF. Below is a report and photos from French activist and photographer, Anne Paq on the March 8 funeral of Mohammed Asfour from her blog, Chroniques de Palestine: popular resistance and human rights. Clashes erupted between Palestinian youth and the Israeli army following the funeral procession of Muhammad Asfour in the West Bank village of Abud, March 8, 2013. Muhammad Asfour, 23, was shot in his head by a rubber coated steel bullet by an Israeli soldier, on February 22, 2013, during clashes in the entrance to his home village of Abud, northwest of Ramallah, during a solidarity protest with the hunger striking Palestinian prisoners held in Israeli prisons. Asfour succumbed to his fatal injury after 2 weeks in the hospital. The same day of his funeral; two other Palestinians were critically shot in Hebron and North of Gaza. Today’s unarmed demonstration (15 Feb) in Nabi Saleh marched in support of Palestinian hunger strikers, including Samer Issawi, Jafar Ezzedine, Tareq Qa’adan and Yousef Shaaban Yassi. 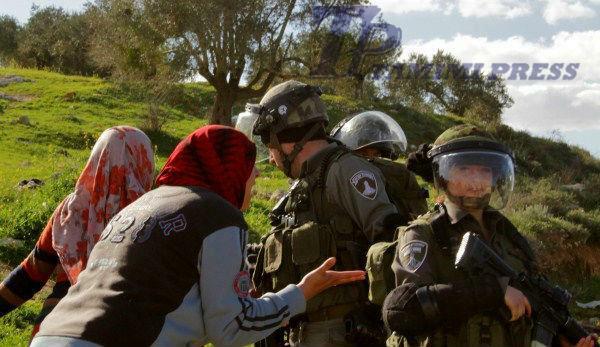 The demonstration was violently attacked by Israeli Occupation Forces (IOF). 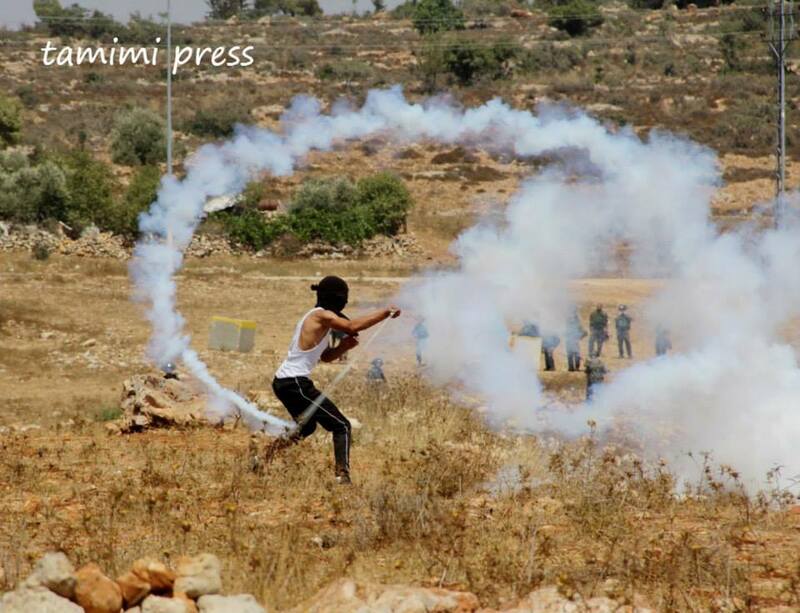 During today’s demonstration, the IOF opened fire with rubber bullets, tear gas, sound grenades and skunk. 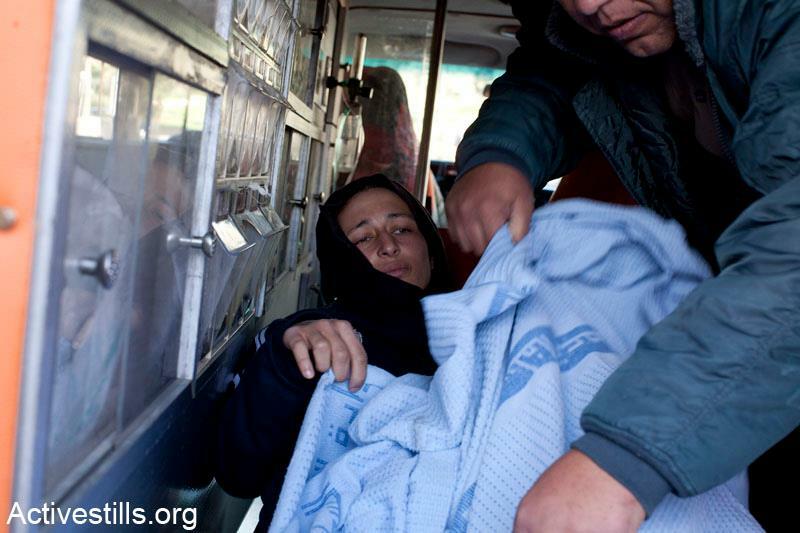 An 18 year old women, Rawal Tamimi, was injured when an IOF sound grenade hit her in the head and exploded. 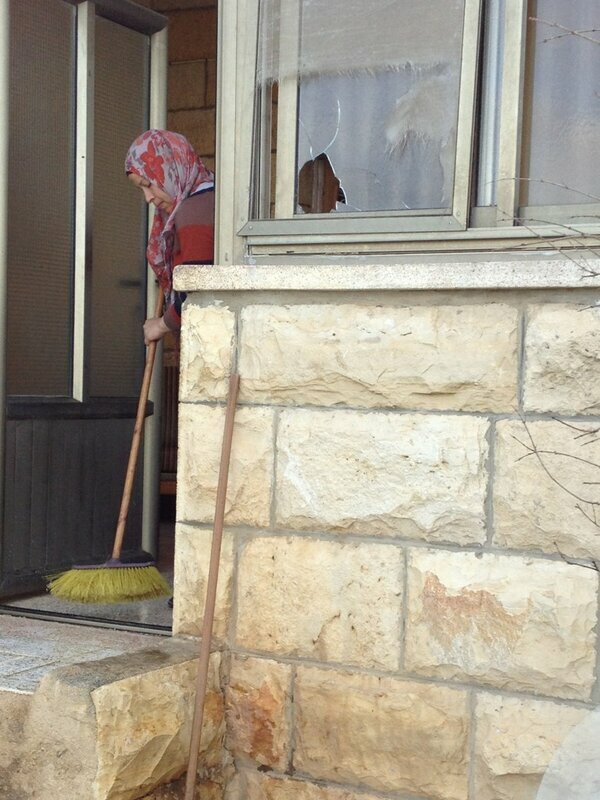 She was evacuated to hospital in Ramallah and remains in hospital over night. 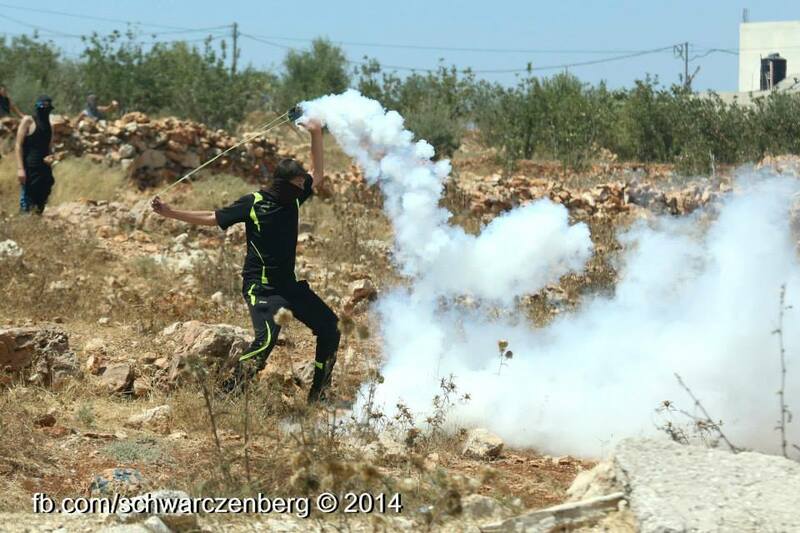 IOF also injured at least 3 others with rubber bullets and many others suffered from tear gas inhalation. 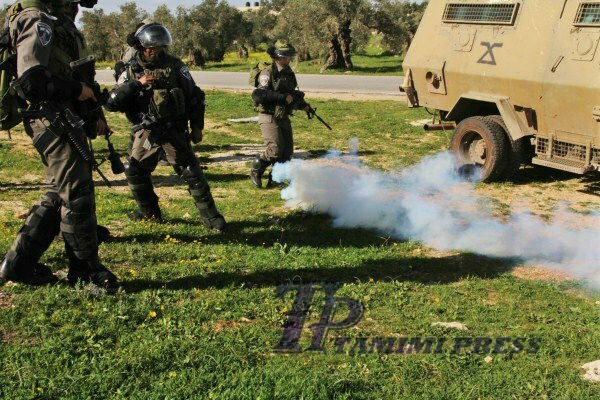 IOF once again sprayed skunk inside the village and at houses – in once instance the IOF used a stun grenade to break the windows of the house of belonging to Bassem and Nariman Tamimi and skunk was sprayed inside the house. 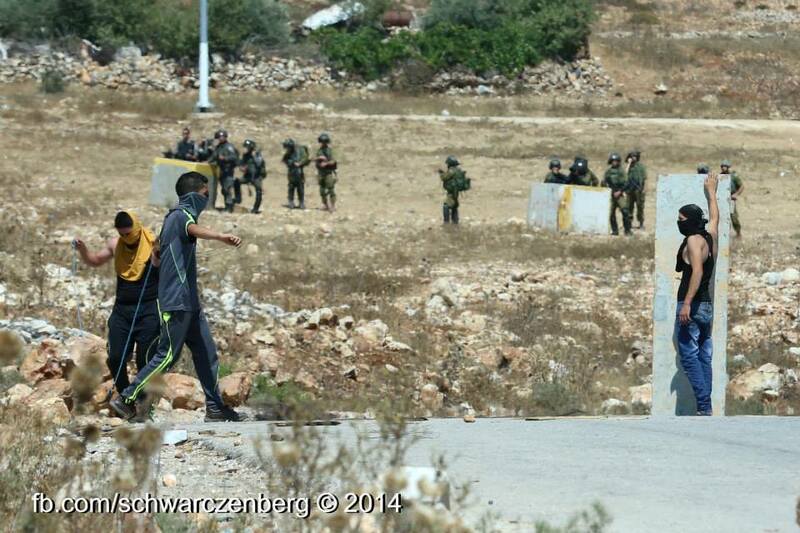 After weekly demonstration concluded, the IOF Leaving the village temporarily. 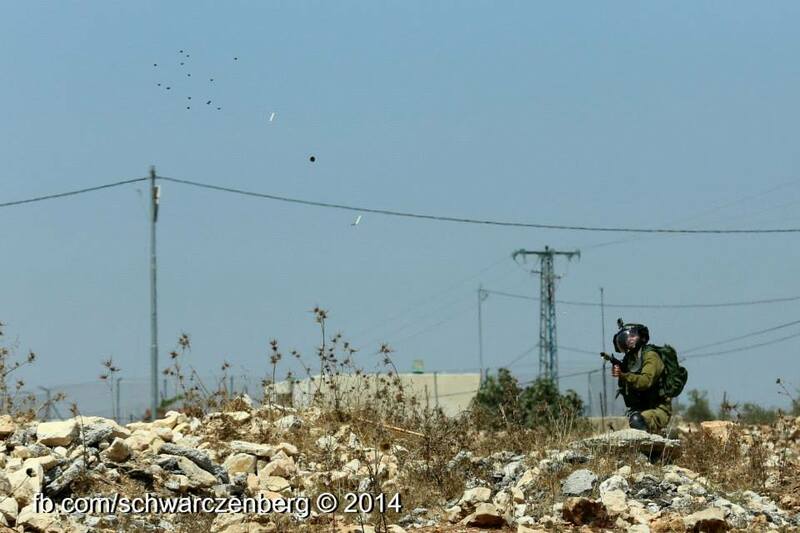 However, the IOF later returned to the village, firing teargas directly at houses. Skunk is also being sprayed. The IOF also closed the gate at the checkpoint at the front of the village and are searching cars. 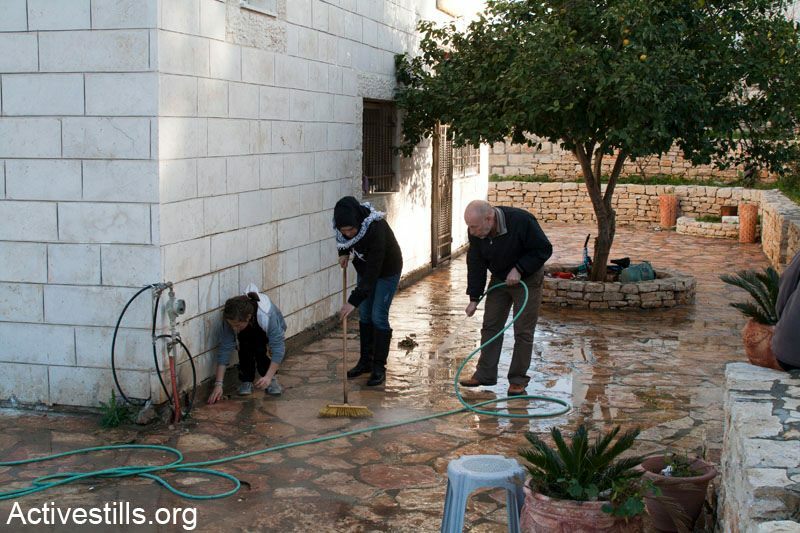 Boshra and Naji Tamimi scrubbing skunk spayed at their house and in their yard by IOF. Thirteen anti-occupation activists were awoken by police officers early Sunday morning to receive closed military zone orders, preventing them from joining Palestinians in weekly demonstrations in the West Bank. Israeli police officers distributed closed military zone orders for four West Bank villages early Sunday morning to 13 prominent activists in groups such as Anarchists Against the Wall, Ta’ayush, and the Sheikh Jarrah Solidarity Movement. In most cases, the military orders were delivered personally, but for some activists who happened not to be home, they were left under their doors. In some cases, the officers came to look for the activists in their old addresses, disturbing family members and friends, entering homes without a court order, and videotaping those present against their will, even after they were requested not to do so. The orders, which are timed from 8:00 a.m. to 7 p.m. every Friday, and are valid from the beginning of September until March 4, define all or part of the villages of Bil’in, Nil’in, Nabi Saleh, and Kufr Qaddum as closed military zones, prohibiting any entrance into those areas. These are four of several villages in which Palestinians hold weekly demonstrations against the wall, joined regularly by Israeli and international activists. The weekly demonstrations are deemed illegal under Israeli military law, much like any form of protest or demonstration in the West Bank. 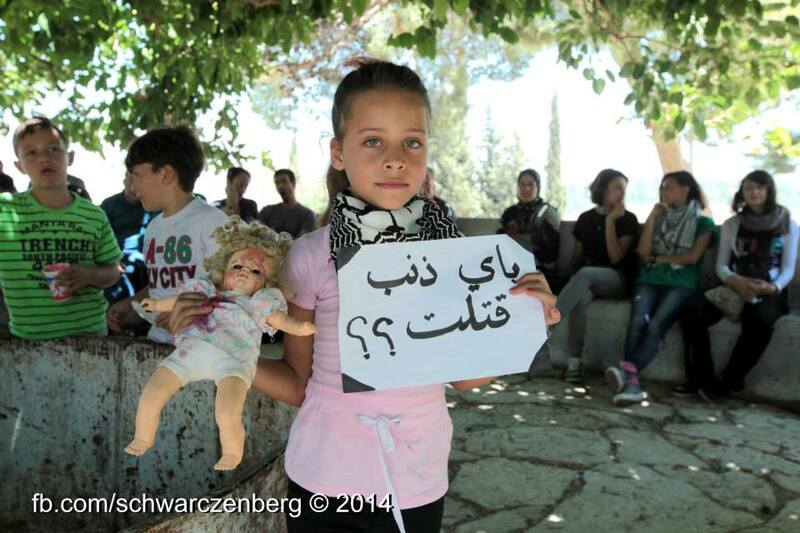 In fact, every Friday, the Israeli military issues orders defining those very villages as closed military zones. The demonstrations are violently dispersed by the Israeli army and police with tear gas, stun grenades, rubber bullets and live ammunition. The military’s violence has led to the death of 28 activists, and the wounding of countless others. Palestinian organizers and participants in those protests face ongoing persecution, includingnight raids on their homes, and long periods in prison, sometimes under administrative detention. The police’s operation seems to be another attempt to sever the bonds between Palestinians and Israelis who take part in acts of popular resistance which challenge institutional policies of separation and segregation. However, those orders are unlikely to deter most activists who join the Palestinians in protest on a weekly basis.